Tata Motors announced it will be accepting orders for the world’s cheapest car starting April 6. The car is a four-seater powered by 624cc engine delivering a whooping 56 mpg. The first 100,000 cars will sell for around $2000 (for the base model) and as you can imagine the demand is huge! The company already has a model for European market in the making and also plans to come to the United States sometimes in 2011 or 2012 but the price of the American version will be more like $4000. How does Nano compare to its American counterparts? I have rolled up some numbers below for comparison. 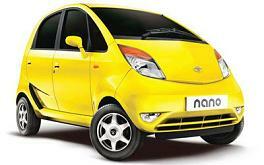 Keep in mind however that Tata Nano is a really small car. It measures a little over 9 feet long, 5 feet wide, and is smaller than Toyota Yaris. The base model has no air bags, AC, ABS, or even a radio! The car I use for my daily commute is nothing like the shiny new crossover SUI we have for the family trips. It is a 10 year old 6 cylinder Honda Accord ‘98 with nearly 150,000 miles on it. The Accord is nothing unique and hardly individual but its dependability is why I bought it and overall I am quite happy. This however is very subjective and I figured I will ask your judgment. I will list all the repairs I had over the 6 years I have owned the car and will ask your opinion - did I get a good deal when I paid 15K for it in 2001? Today, had PO401 check engine code and got diagnosed clogged EGR intake ports. The diagnosis and repairs will cost $353.35 plus tax at the local FireStone. Regular oil changes every 5K miles and tire rotations every other oil change (every 10K miles) plus changed the transmission oil a couple times. I was a bit upset by todays expenses but after a bit of research found out that EGR valve is a usual problem with this year model and would be a warranty repair if I had it before 80K miles. 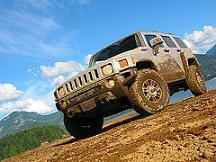 A much greater concern is the transmission problems which other owners have reported. So far, no problems yet but I hear this can end up being a $3000 expense. How much does the peace of mind cost? How far will you go for your safety when choosing your new car? Just several years ago I would not have given it much thought. My first car was Toyota Corolla which I drove for 5 years before trading in for a bigger Accord. There were two reasons really. One - I am tall and there is simply not enough leg room in small Corolla. Second, and it took me a while to admit this to myself, I felt pretty scary each time standing on a highway in the left turn pocket and feeling how passing by cars shake my Corolla as if it was a small boat in the middle of a storm. We bought our second family car in 2003 and it was a Mazda minivan. This was also mostly a financial decision - Mazda is smaller than the competitors and has slightly better fuel economy. 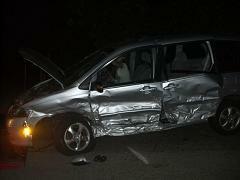 That minivan was declared a total loss by my auto-insurance earlier this month after my wife got into a multiple car accident involving a drunk driver. You can see the van (or what is left of it) on the photo above which I took right after the accident. Overall in the past two years we have been in a few accidents, every single time reevaluating our life priorities. All the accidents were due to the other driver fault and we consider our driving habits pretty safe. The only variable we can really control is the kind of the car we drive. So one of our priorities became an intention to drive safer cars than what we currently have. Being a bargain hunter and an overall proponent of everything ‘green’ I did a seemingly irrational thing last Saturday. I bought an SUV as a replacement to our family van. Of course this is not just an SUV. 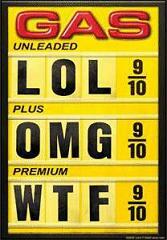 I have done everything I could to make it a bargain among SUV’s. It is a base model cross-over SUV (no bells and whistles to pay for) but it does have All Wheel Drive (safer winter driving) and has good safety ratings. It is one year old and I did haggle like a crazy. For the curious types, it is 2008 Mazda CX-9 and we paid 22.5K. Now, tell me please. Am I overreacting? Is the peace of mind (even if imaginary for the most part) worth the money I have paid and will be paying for the extra gas to feed this monster? What would you do if you were in my shoes? If you have looked at the GM stock lately then you will not be surprised why the company is announcing this new marketing campaign. Declining truck sales have been hurting GM badly and this is their latest attempt to lure customers into clearing some of the truck inventory before the company closes down those money losing plants for good. Below are some details on the promotion which starts tomorrow, but don’t expect to find me at the GM dealership because I plan to squeeze at least another 100K from my Honda. The carmaker will offer 0% financing for loans as long as six years on most of its 2008 models. Vehicles included in the program range from large SUVs such as the Chevrolet Suburban to small two-seat sports cars like the Pontiac Solstice. The promotional program - which will only be available from Tuesday through next Monday, June 30 - will be called the “72-hour sale,” the company said. “We’re really trying to spark the market here at the end of the quarter,” LaNeve said. Regardless of what my plans are, this could be a good deal if you are looking for a long financing on a new car. The trick might be however is less freedom negotiating the price, I would expect a lot of pressure from the “hungry” sales clerks during the promotion. So do your homework as usual, plan ahead and come prepared. I have speculated if I should write this post for a very long time. There is just so much already written on the subject and it is very hard to add anything new. Nevertheless I decided to do so. Partially because I wanted to have a list of tips that I myself would follow, so to say a TODO list. I intend to update it as I discover more tips over time. Have you found these tips useful? Which ones did and didn’t work for you? Please share your own money saving tips in the comments.